Foster Dad 11: What Do You Do When You Loved And Lost? About 7 weeks ago our county social worker warned us about losing our lil guy to the biological parents. Then the social worker asked us if we would foster again. She told us that we did such a good job that she wants to see us do this again. Our initial response was not an outright yes. We hesitated because of the heart-wrenching drama and the holes in the system we’ve seen. Since that conversation we have been emotionally and mentally preparing ourselves to surrender this child that we have loved, nurtured and raised as our own. No one could tell that he was not our child because we treated him like he was ours; and he needed to feel like he belonged to a family. We haven’t lost our lil guy yet, but we’ve emotionally prepared ourselves for that loss. We already cried, told him how much we’ll miss him and started the process of preparing for his transition, because once the judge or the Department gives the green light to return the child to the biological parent(s) it will take effect immediately (as in that day). So we’ve been cherishing him, caring for him and saying our good-byes to him all at the same time. I don’t know anyone who has not loved and lost. The big question on the other side of that experience is will you and can you proceed from there to experience love and give love. Many who get burned in one experience will fearfully avoid another experience or at least be very guarded about entering into it. But I think one of the greatest strengths in life is to love and love again. Yes, you may get burned. But I think the risk also qualifies the genuineness of that love. It’s because I have something to lose that makes my voluntary love for someone that much stronger and purer. Love without cost is convenient and easy. Loving and losing is not a regret of the past but a mark of your capacity to love. Love then is not simply a reaction given to the object of your affections but it is a quality coming from within you. 1 Corinthians 13:7 says love always perseveres, that is it endures. My wife and I will choose to endure in love. To love and lose will be part of our story but it will not be our defeat, for to love again is our triumph. So just two days ago, my wife calls our foster social worker to ask if we qualify to take in another foster baby while our current one is likely transitioning out of our care. We were simply inquiring. Then the matching social worker called us yesterday afternoon, saying there was a 10-day old infant needing a family. His issues and needs were pretty much the same as our lil guy but his circumstances were much more severe and dire. So we said, “Yes!” We drove an hour and a half to the hospital with Lil Guy, where a good friend met us there with a new car seat she helped us purchase from Target, spent over two hours at the hospital to consult with the nurse and sign papers with the emergency social worker, and came home with a 5 lb little boy whom we have affectionately nicknamed, “Peanut.” Call us crazy, but we chose to love again. What is Freedom and Why We Want It? Freedom is of non-negotiable importance to us because having it affirms the most fundamental dignity of our humanity. Many films, stories and historical events hail freedom as an indisputable quality of human life. Everyone wants it. People will even die to ensure that others get it. To deny others their freedom is to deny their right to being human. It denies their given worth, dignity and value as soulish, sentient beings. In cases where freedom is denied to others, oppressors must carry the worldview that the oppressed are sub-human, commodities or instruments whom are of lesser worth than they. A view of equality with others demands a respect for the freedom of others. But what exactly does freedom mean? Does it mean you can do whatever you want with constraint, without limitation? Is it the same as having power? Most generally tend to define freedom according to a quantifiable perspective. How much you are allowed to do or able to do defines how much freedom you have. I’ve been asked a number of times, “Why be a Christian if all it does is limit your freedom with rules of what you can’t do?” Good question. Freedom was not only viewed in quantifiable terms by the great philosophers of old, like Aristotle, the great theologians of the Christian heritage or by the Bible. Instead of defining freedom by quantity what if we defined it by quality? Freedom should be defined by telos, an ancient Greek term that means purpose or design. For instance, if you were a knife, what would define your freedom? What does it mean for a knife to be free? Is it based on how many different things you could do? If a knife were used to tighten screws, dig holes in the ground or open bottles and cans, the knife would not experience greater freedom even though it’s doing more things. In fact, that knife would not be very free. Freedom for the knife would be in cutting – cutting vegetables, fruits, meats, rope, cardboard, paper, etc. – and in doing it well. The more a knife can cut and cut well, the more freedom that knife has. According to this notion, freedom is defined by design. Freedom is not measured by how much you can do but by whether you’re doing what you’re designed to do. If we use the teleological view (telos) to define freedom, what would it mean for us? Living out our designed and living it out well determines not only our capacity of freedom but our quality of living a flourishing life. So, doing more or doing whatever you want doesn’t make you free. In fact, if you’re doing a bunch of things you weren’t supposed to be doing, it makes you less free – like a knife trying to unscrew screws but never cutting. The Bible tells us that we were designed to love God and love one another – the second being most realized by the first. Christ redeems us and recreates us from being slaves to our vices to being children of God, which is what we were designed to be. So a negation of our freedom is not merely a matter of limiting what we can do but prohibiting us from being what we’re supposed to be, called to be or designed to be. Restrictions can serve to enhance our freedom then because they empower us to be what we’re meant to be. Many of us are fighting for more freedom in our lives – financial freedom, relational freedom, freedom from limitations, freedom to have more choices, freedom to spend, freedom to do. But we shouldn’t be too drawn into a consumerist view that freedom simply means more. Rather we should incorporate a teleological view that freedom means purpose – discovering our purpose and fulfilling it well. So, are you free? Someone said to me, “Brian, you are ambitious.” I don’t know if I would consider ambition as one of my qualities. But I do believe in answering our callings. We only have one shot at life so I think we should make it count. Callings are not quite the same as desires. The two could overlap; you may desire the calling you have but a calling does not require you to like it. The reason the two can differ is callings come from outside of you. I think a calling is like a highly respected general calling you to charge up the hill and take out that bunker. You may not like it. You may be afraid of it. But you will let out that battlecry and give it all you’ve got! A calling has a strong compelling that feels larger than you and your life, and it usually is. In those moments of facing a calling, you have a choice of answering it or ignoring it. Ignoring it will often feel like disobedience and like you’re missing something very vital to your purpose for being on this earth. A desire achieved feels satisfying. A calling achieved feels fulfilling. I think most people live by desires and not by callings. That’s usually because we think if we get what we want, we will have lived a complete life. I think we’re all called to be more than we tend to realize, because we either downplay our roles in this world or succumb to distractions. For some of us, we aren’t able to say yes to our callings because we haven’t said no to other things. Callings also tend to come in packs. A fellow faculty at Biola said, we can have multiple callings – being a mother, husband, charitable person, minister, artist, writer, missionary, corporate executive, nonprofit board member, soup kitchen volunteer, inventor, son, daughter, employee, storyteller, good neighbor, Christian… and it’s about living out those callings the best we can. Figuring out what you really want in life requires artful insight. Callings can also be seasonal; they need not be forever. Callings can be communal, meaning not the only one bearing it. And callings can be transferrable, meaning you may be called to pass the torch to another who shares the same calling. Figuring out what your calling is in life requires very, very good listening. My callings come from God and I try to listen to him the best I can. I can’t say I always nail it but He’s patient and a very good communicator. So I might not call myself ambitious, but I strive to be a good listener. Since the second day we received our foster son, there are three things that I tell him daily: We love you. God loves you. Jesus died for you. I tell him, “We love you,” so he would know that he is safe, accepted in this world, and well cared for. I tell him this so he would know that we are here for him no matter what and that we are glad he came into our lives. I want him to know that he is part of our family for as long as God would have him with us and that today he is not rejected, discarded or unwanted. He is dearly loved. I tell him, “God loves you,” so he would know that he is not forgotten in this vast world by the One who created it. I tell him this so that he would know the eyes of the heavenly Father are upon him and that no matter what brokenness, losses or pains he may have faced or will face, he is still and ever will be loved by God. I want him to know that his life was no accident, but everything about him and his story is a miracle. I want him to know that grace unbound is available to him. I tell him, “Jesus died for you,” so that he would know the extent to which he is loved, that his Heavenly Father held nothing back from him. I also tell him this so that he would know he doesn’t need to be perfect. He can admit to being broken. He can feel lost sometimes. He can be flawed. He can because the Son of God died as an atonement for his sins to be the grace he needs in every broken part of his humanity. Whatever he may feel is lacking in himself, Jesus has accomplished for him by his sacrifice. I tell him this so he would know the incredible act of love that was done for him and that he can accept this grace if he chose. So today, before he goes to sleep, I will tell my foster son, “We love you. God loves you. Jesus died for you.” Lately, he’s been responding to me with smiles and “coo’s”. When a great man leaves this world, it leaves behind a sad emptiness and an inspiring legacy. It’s like a tragedy that makes you cry but enriches you as a person. I’ve been crying all day upon learning that Howard Hendricks passed away this morning. He was an influential mentor to me. 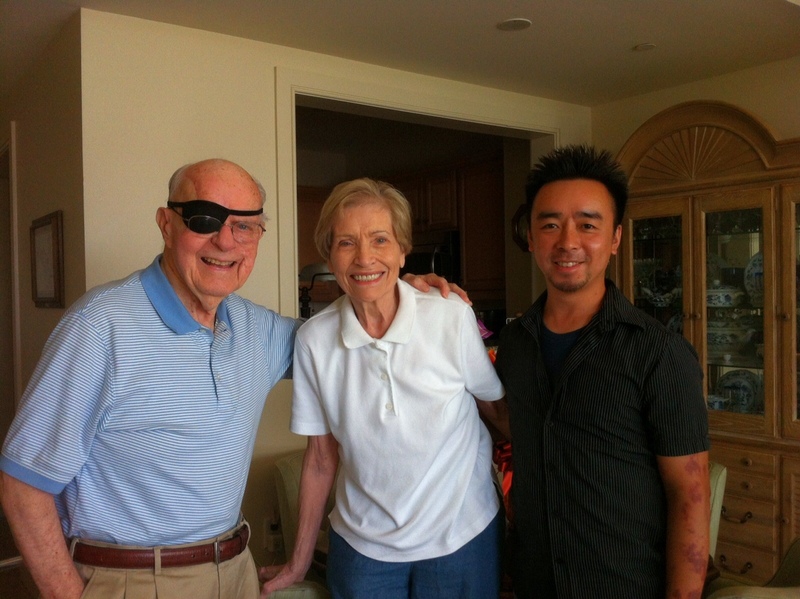 Both he and his wife Jeanne became dearly beloved friends to my wife and me. “Prof” as he was fondly called, poured into so many lives, including mine. On a number of occasions, people referred to me as one of “Howie’s boys.” I learned later that “Howie’s boy” was a term given to those who sat under his mentorship. I came to proudly embrace the term, however it was not a term of elitism because anyone could’ve been Howie’s boy. He discipled generously. It was what he called his “ministry of multiplication.” In the end, the legacy he left behind were not grand stadiums or shiney trophies, but ever-blazing torches he fanned in the souls of many who would live for God with relentless passion. As a professor and mentor, he spoke to me candidly. When I gave my first crack at being a writer, I showed him thirty pages of a book manuscript I wrote. He read it. We met. And he said, “Your idea is great. Your writing needs A LOOOT of work. Have you ever taken a writing class ever in your life?” HaHa. That instigated me to diligently study writing at seminary. He’s one of the reasons I disciple others and pour into others’ lives, because he said, “I do this for you so you can do it for others.” He’s one of the reasons I found my passion in teaching the Bible when he said to me, “You’re the guy we’re looking for” to validate me as a teacher. He could never be found at fault in building up himself, because he was focused on building up others. He’s the reason I don’t believe in retirement, that as long as God has me here on earth I’m here to serve Him. As Prof said, retirement will be in heaven and we have all eternity for that. He helped me to believe that “the man of God is immortal until God calls him home,” as he exemplified. But he always said that behind the great man that everyone perceived him to be was his wife Jeanne. If you met her, you would know what a pair they made and the grace she was in his life. My wife and I saw him and Jeanne only months ago last September. I was moved to see an old man who was like a spirited child before God with an unwavering faithfulness. During our visit with them, I was amused by the few times he repeated to me, “I think I’ve concluded that you have not change a bit! You look exactly the same! Incredible!” Then he laughed. The most touching moment was when the four of us stood together with our arms around each other in a circle to pray and before we prayed he looked over to Jeanne and said with a big, warm smile, “This is my lovely wife.” What a man he was. There are those who inspire by what they teach. There are those who inspire by what they do. Then there are those who inspire by who they are. In his life and in his passing, I am inspired to live well. My tears of sadness over losing him are paradoxically juxtaposed by delightful visions of him joyously dancing before Jesus with his one index finger waving in the air. Good-bye, Prof. I’ll miss you deeply, but I will see you at home one day. I recently read Philippians 4:6-7 again. It’s one of those familiar passages that catches your attention because of the result that’s promised at the end of it: the peace of God that guards your heart. Who doesn’t want peace? In the urban city centers of L.A., peace is a coveted commodity from the homeless man to the Beverly Hills dweller. The path to peace is in having the faith to present your requests to God. But then, the verse tells us something unexpected, atypical and almost illogical. You’d have to do a double take on it and ponder on it for a moment to allow it to sink in. It mentions ‘thanksgiving’ but not in a way that we normally understand it. Thanksgiving is generally thought of as a response to fortune, blessings and favor. So during the Thanksgiving Holiday, we encourage each other to be thankful by thinking of the good things that you received which may have overlooked during the year. You thank God for your health, safety, family, a roof over your head, etc. By doing so, we develop a positive attitude of thankfulness. But this really isn’t the thrust of these Bible verses when it talks about thanksgiving. The verses tell us to pray and petition with thanksgiving in our hearts. The thankfulness does not come after a blessing has been received, after a prayer is answered, or only for things you already possess. The heart of thanksgiving accompanies the request. Thankfulness is not merely responsive; it is preemptive and proactive. Well, how can you be thankful when you haven’t received? The thankfulness is an attitude of the heart toward God, and it is a way in which you interact with God. You can talk to God with gratitude and thanksgiving. Your prayers and petitions can be out of a honest desperation, need and yearning, but it doesn’t have to be absent of thankfulness towards God who hears you, loves you, watches over you, and is able to provide for you out of his wisdom. In this way, thanksgiving is unceasing and it remains when prayers are answered and when they are not, because thanksgiving is part of the way you pray. Thanksgiving then is a power to us even in our times of need and not only a reaction in our times of plenty. It is not in the things you have that give you peace. It is your secure relationship with God, whom you can cry out to with thankfulness that welcomes the peace of God into your heart. This Thanksgiving Holiday, seize thanksgiving as a way you pray and not only as a reaction to prayers answered. Pray for something you have not received yet and try being thankful in that request before God. Happy Thanksgiving! What do Bruce Lee and Yoda have in common where they speak truth into life? They are two of my favorite celebrities. Both martial artists. Both philosophers. Both hold the same understanding of the difference between well intentions and actualization. Many of have a number of well intentions, but well intentions alone do not create real changes or events until they are actualized. Bruce Lee said, “Knowing is not enough, we must apply. Willing is not enough, we must do.” Yoda said, “Do or do not; there is no try.” Knowing, willingness and trying are great starting points for action, but by themselves are not the same as actual happenings or events. They do not by themselves change circumstances or tangibly contribute to progress until they are applied and acted upon in a definitive way that creates real changes in the conditions of our selves, lives and society. It is like the difference between potential and realization. Our society’s extreme emphasis on the psychological optimism of potentials downplays the need for realization of those potentials. Potentials don’t create real changes. Realization of those potentials do. Potentials are simply the possibility of something happening. Realization requires the commitment, consistency, perseverance, focus and decisive determination to make something actually happen. Otherwise, potentials that are never exercised or applied never materialize into something tangible nor have any real effect. Many of us, especially those of us who are artists in this town of Hollywood, have ideas, intentions and dreams. Where the rubber meets the road, where the child’s play is separated from the adult work, is where those who mature those intentions into actualization. This principle is true with our dream careers, habits we’re trying to break, relationships we’re trying to mend, health needs we want to meet, and the discipleship we intend to walk. There’s a vast difference between being just a dreamer and being a creator. Saying to yourself I really want to do that, I dream of that, or I’ll start that tomorrow doesn’t produce any real effects. So what is your obstacle? Mentally, emotionally, circumstantially, physically? Maybe today is the day that you take the first tangible step to kick that habit, heal from that old wound, practically love that person like you’re meaning to, reconcile that relationship, start that diet, paint the first layer of that painting, write the first paragraph for that story, read the first page of that dusty book, develop the first bar of that song, address that question of life, or take that first step of discipleship in Jesus. Enough of the mere I know, I want to, and I’m trying to; and let’s apply the decisiveness, belief, commitment, determination, fortitude and perseverance to make it happen. When we do the good we know to do, we’re not only better for it. Our world is better for it because we’ve created some tangible measure of good that has a real effect. "I recommend Brian's book. There is a perfect alignment of Brian's writing about beauty found in Christian theology, and the true and consistently applied moral premise in a story." -Stan Williams, author of "The Moral Premise"